June 18, 2010 - On our trip leg from Grants Pass, OR to meet up with friends in Redding, CA on I-5 I was notified by the Pressure Pro monitor that our right, inside, rear tire on the Providence was losing pressure; reading 85 lbs from a normal road pressure of about 105 lbs. We were about 10 miles north of Weed, CA. The pressure continued to drop at a rate of about 10 lbs per minute. We pulled over to the shoulder and stopped. The pressure monitor was now reading 50 lbs. A quick inspection certainly revealed a deflated tire but could not determine the cause. Next step: limp at low speed to the Weed southbound rest stop about 1.5 miles away to get off the highway. I called the closest Les Shcwab tire store (Mt. Shasta) and ordered mobile tire service. When the wheel was removed it showed the tread literally separating from the tire (see below). It was a defective Goodyear tire. 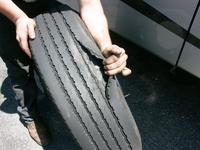 We were fortunate to have the technician find a replacement, but not a Goodyear. I was a bit surprised this size tire (275/70R 22.5) is not readily available (the technician had to drive to the Oregon border to pick up a tire of the right size). The pressure monitoring system prevented a potentially disasterous outcome. I could not feel any difference in handling and if the tread had completely separated without my knowledge it could have caused significant damage to the motorhome as well as the tow vehicle. Motorhome tires are not readily available. I eventually removed the new tire and replaced it with a Goodyear from the front then put two new Michelins on the steering axle. The non-Goodyear replacement tire is now stored as a spare. I can't imagine being stuck on the side of a highway with a motorhome tire issue waiting for a replacement. Thank you Pressure Pro and the initiative of the Les Schwab technician for getting us back on the road within 3 hours of the incident. I now feel a bit more confortable with a spare tire. While this is a guideline for air inflation, it does not necessarily trigger the system if you deviate from the recommended tire pressure as long as all the tires have the same amount of air in them. Checked out your site and appreciate the wide range of products and services you offer. Not sure what your comment is referring to. Proper pressure for each axle is determined by tire specifications and actual weight on each wheel. For a motor coach, it is important to balance the load as close as possible on each axle (equal weight left and right on an axle) then inflate the tires on each axle to the calculated pressure. Tire manufacturers publish load/pressure tables used for determining proper pressure for load safety and proper tire wear. When each tire is inflated to the desired pressure and individual sensors are activated, the Pressure Pro system records each tire's pressure as a baseline for that tire. So, if a single tire deflates 12.5% below the baseline, an alert is sounded and displayed. So, even if one might deviate from the proper pressure, the system will still alarm if an individual tire pressure is detected to be 12.5% below the set baseline. There are a number of types of wireless tire pressure monitoring systems, ranging from a version in which the sensor is embedded in the tire and read with a handheld device to a system that updates in the cab of the vehicle while driving, keeping the motorist constantly aware of changes in tire pressure.